Holiday-themed cartoons were a staple of the industry for many decades, particularly Hallowe’en, but Independence Day had a few — OLD GLORY, Chuck Jones’ first Porky Pig short was released on July 1, 1939, in time for the holiday. However, this is the oldest surviving and quite possibly the oldest Fourth of July cartoon produced. 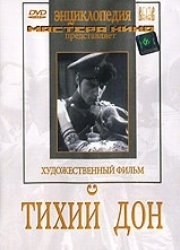 And Quiet Flows the Don (original title Tikhiy Don) is a Soviet 1930 B&W movie based on the first part of the famous novel by Mikhail Sholokhov. It depict the fate of a Don Cossack family before and during the World War One. Beware the ire of the sacred God Ammett, or any other of those Egyptian Gods for that matter. As a bellhop in a hotel, Hughey managed to get possession of a wonderful ruby, the eye of Ammet, and with its aid obtained an introduction to a millionaire and his beautiful daughter. But Hughey failed to remember that for every ruby or other gem stolen from an Egyptian shrine, there is a bearded sheik who has taken a vow never to eat, drink or sleep until the talisman has been returned to the irate God from whom it was stolen, and vengeance has been wrought on the guilty one. Just when Hughey is enjoying himself immensely at a fine little dinner with the fair damsel, his nemesis, the sheik, discovers him and a lively chase takes place. The sheik gets the ruby in his possession but Hughey regains it in jig time and the prospects are that the poor sheik will have some wait before he can look a square meal in the face again. At the end of World War I, infamous safecracker Square Kelly returns home to San Francisco, weathered by the ravages of war. Accompanied by Jack Riley, the soldier with whom he served in the trenches, Kelly descends the ship’s plank to dockside, where he is greeted by Jack’s father, Lt. Riley of the San Francisco police department, and Jack’s sister Nora. Kelly then goes home to his aging mother, who informs him that his brother Jim and the rest of his old gang are waiting for him at Tierney’s Café, the criminals’ headquarters. As his mother eagerly recounts the gang’s plans, Kelly begins to experience doubts about his former way of life. Nevertheless, Kelly goes to the café, where he is welcomed by Tierney’s daughter Rose, a victim of her father’s abuse. As the gang tries to enlist Kelly in their future exploits, Jack discusses his friend’s reformation with his father, then calls to invite him for dinner. At dinner that night, Lt. Riley offers Kelly a job on the police force and a chance to go straight. Upon returning home, Kelly is torn between the Lieutenant’s offer and Jim’s entreaties to join him in a burglary planned for later that night. After agreeing to meet Jim and the rest of the gang in ten minutes, Kelly reflects upon the horrors of war and determines to relinquish his life of crime. When Kelly informs his mother of his decision, she denounces him as a coward and throws him out of the house. Outside the café, Kelly tells a relieved Rose that he plans to go straight, prompting her to warn him that her father will seek revenge. After Kelly announces that he is quitting the gang, Tierney challenges him to a fight and Kelly soundly thrashes him. To retaliate, Tierney decides to pit Jim against his brother. With Jim as his accomplice, Tierney breaks into a home on Kelly’s beat. When Kelly discovers them, Jim refuses to shoot at his brother and Tierney shoots Jim in the back, drops his gun, then flees. Feeling responsible for his brother’s death, Kelly visits his grieving mother and, after showing her the gun that killed Jim, proclaims that he is no longer acting as a cop, but as a man seeking vengeance for his brother’s murder. Finally forgiving her son, Mrs. Kelly identifies the gun as belonging to Tierney. At the tavern, Kelly confronts Tierney. After Tierney shoots and wounds Kelly, Kelly returns fire and kills him, and then declares that Tierney was resisting arrest. While convalescing with Rose at his side, Kelly is visited by his mother. Their reconciliation is made complete when Kelly informs her that he plans to marry Rose and she offers her blessings.